Historic Tougaloo College is proud to announce it was awarded $270,000 by the National Park Service for the interior preservation of the Robert O. Wilder Building, known as the Mansion. In addition, the Tougaloo College Research Development Foundation, Inc. has been added to Mississippi Senate Bill 2002, which earmarked $1 million for the interior repair and upgrades to the Mansion. The news of this funding serves as recognition of the historical value of Tougaloo College as well as the need to preserve that history. President Beverly W. Hogan said the announcement of this federal and state funding comes at a pivotal moment in the College’s history. “This is significant as we approach our 150th year in 2019,” said President Hogan. “The Mansion is the only physical structure remaining on the campus from the earlier days when the site of the campus was the John W. Boddie Plantation. The Mansion holds historical significance as a campus focal point, and one that stands as a fluid narrative of Mississippi’s history as Tougaloo College portrays its parallel history through the lens of the transformative power of education,” said President Hogan. 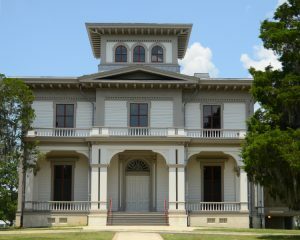 As a Mississippi Historic Landmark, listed on the National Register of Historic Places, the Mansion at Tougaloo College became eligible to receive a Historically Black Colleges and Universities (HBCUs) Grant, which supports the preservation of such sites on HBCU campuses. The HBCU Grant Program is part of the Historic Preservation Fund that Congress allocates from federal oil leases on underwater land in the Gulf of Mexico, known as the Outer Continental Shelf. Tougaloo College Alumnus Congressman Bennie G. Thompson said he is proud the Mansion was selected to receive preservation funding from the National Park Service. “It is an honor to be a voice of support in the allocation of federal funds to preserve the Eagle Queen’s the Mansion,” said Thompson. “Tougaloo is one of 19 Historically Black Colleges and Universities (HBCUs) to receive funding from the National Park Service to aid in the upkeep of historic buildings on the campuses. This is important to me personally, because the institution offered so much. It was the place I met the love of my life, worked on the Congressional race of the late Mrs. Fannie Lou Hamer, and where I established life-long friendships. The preservation of the Mansion will continue to be a reminder to current Tougaloo students and alumni that Mother Eagle will forever soar,” said Thompson. The receipt of federal as well as state funding to preserve the historical Mansion implicates the importance in recounting civil rights history and engaging future generations, and President Hogan looks forward to reopening the Mansion because it symbolizes more than a physical building. Referring to the HBCU Grant, President Hogan said, “This, coupled with the recent action of the Mississippi legislature, positions Tougaloo to realize the vision of cutting the ribbon for the reopening of the Mansion in 2019, celebrating its resilience for more than 150 years. Our gratitude is extended to all who helped to make this possible,” said President Hogan.